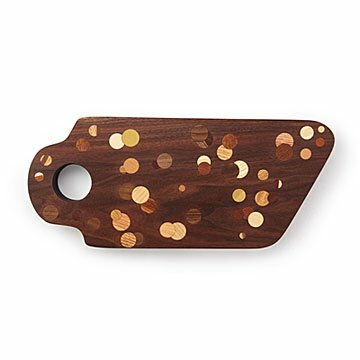 Made of reclaimed walnut, each hand-crafted board has a one-of-a-kind dotted pattern. Where there's snacks, there's a party. Cody Hughes and Ali Wedewer's festive serving board is ready, complete with confetti. They add "dots" of various types of wood to the top of a block of locally sourced walnut, designing a different pattern each time so no two are exactly alike. All the wood is reclaimed, which is something to celebrate in itself. But so is cheese. Handmade in Philadelphia. Born in Brooklyn, based in Philly, Cody Hughes and Ali Wedewer craft one-of-a-kind home goods using high-quality, ethically sourced materials. They design through their artist lens to create pieces that meet at the intersection of utility and beauty. Cody has been a woodworker since he was young, honing his craft as a sculptor and later finding a love for functional forms. He makes everything in his shop by hand using hand tools and recycled wood. Ali is a photographer and art director, making sure every one of Cody's pieces is represented in all its beauty. Clean with mild soap and water and dry immediately. Not safe for dishwasher or soaking in the sink. Apply food safe oil throughout use to keep wood healthy.